Sometimes at this time of year I start feeling so cooped up that all it takes is an excuse, and we'll pile in the car and head out. So if you're susceptible to suggestion, the folks at Pholia Farm, artisan goat cheesemakers extraordinaire, are having a Holiday Open House the weekend of December 15 and 16. They'll be featuring their goat cheeses paired with local wines, along with hay rides, the cutest baby goats you've ever seen, a tour of their solar and micro-hydro power plant and, of course, cheeses to bring home for your holiday entertaining. It's an opportunity to try cheeses that aren't readily available in most stores, and the town of Rogue River is just off I-5 between Grants Pass and Medford, close to Ashland and Jacksonville, both worth visiting. Details: Pholia Farm Holiday Open House. Dec. 15-16, 11 am-3 pm; free. Pholia Farm, 9115 W. Evan Creek Rd., Rogue River. Phone 541-324-8993. 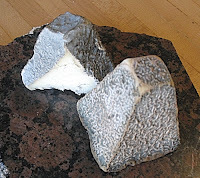 Photos courtesy Pholia Farm and Pacific NW Cheese Project.